The original shale gas play, the one that kicked off the shale drilling bonanza a decade ago but then went into decline, is getting a new lease on life. The Haynesville Shale, which straddles the Texas-Louisiana border, has seen a resurgence in natural gas production, after years of neglect. The Haynesville Shale is one of the founding fathers of the modern shale drilling boom. 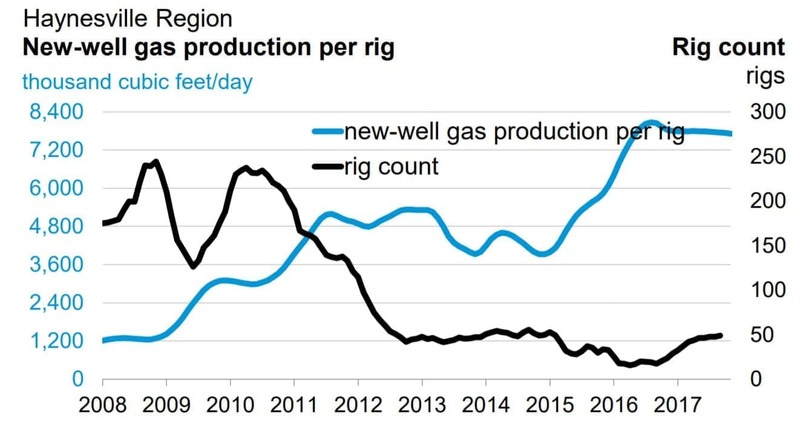 A decade ago, fracking unleashed a wave of natural gas production as hundreds of rigs piled into northwestern Louisiana. But the surge in production pushed down prices, which had been high and relatively volatile for years. The crash in prices meant that shale drillers moved on to greener pastures, and most of them began looking for oil rather than gas because crude fetched $70 to $80 per barrel. By then, the Marcellus Shale was just beginning to ramp up, boasting rock-bottom costs of production. 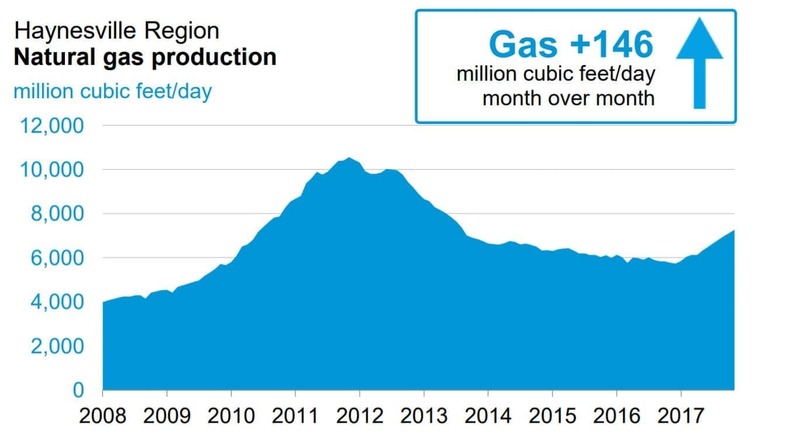 The massive surge in production made the Haynesville Shale somewhat redundant, and the Marcellus Shale took over as the country’s premier gas producing region, as it remains today. The best days for the Haynesville were already over. But, the Haynesville is enjoying a second wind. The recent uptick in production is a story of advancements in drilling technology, a renewed interest from major financial institutions, as well as its proximity to new demand centers. Related: Is The Aramco IPO On The Brink Of Collapse? Natural gas production in the Haynesville is up 20 percent so far this year, and the EIA predicts output will increase by another 2 percent between October and November. The rig count current stands at 44, up from just 16 at this point last year. One of the reasons for the uptick in production is more efficient drilling techniques. Chesapeake Energy, an early pioneer of the Haynesville Shale, told investors that it’s squeezing more gas out of each well by drilling longer laterals, according to The Wall Street Journal. Another method that drillers are using to boost output is refracking, which is pretty much what it sounds like: refracking old wells that had already been drilled. The difference this time around is that drilling technology is much improved, allowing companies like Chesapeake to get another bite at the apple. But it isn’t just that drilling techniques have improved. A new wave of finance is also sweeping over the region. This time around, private equity giants are trying to profit off the long-overlooked Haynesville. The WSJ reports that private equity-backed companies have spent billions buying up Haynesville acreage from oil majors like ExxonMobil and Royal Dutch Shell. At odds with the LNG craze is the flurry of petrochemical complexes that have been built in Louisiana and Texas over the past decade, hoping to take advantage of the abundant gas supply. The WSJ estimates there are about 80 major petrochemical facilities under construction in the region, with plans to make fertilizers, plastics, and other industrial products. The petrochemical industry battled LNG developers years ago in Washington, hoping to slow the growing federal support for U.S. gas exports. LNG suppliers largely won that fight, and gas exports have been given a green light. So far, the feared price increase for gas hasn’t played out, at least not yet. Then there’s the steady rise in gas consumption for electricity generation. Coal has fallen victim to cheap gas and renewables, and shuttered coal-fired power plants have been replaced by many more plants burning gas. Gas consumption in the electric power sector has jumped by 50 percent since 2008. Gas exports, petrochemicals and electric power generators are all vying for cheap gas—for Haynesville shale drillers, that’s welcome news.